The city of Shanghai in China has enforced a new one-dog policy because of its fast growing population of dogs. The city wants to improve and maintain the city’s environment by curbing excessive barking, preventing excessive dog waste and dog attacks. Dog ownership has risen along with China’s fast growing middle class. 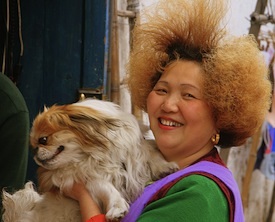 Shanghai’s dog population is estimated to be around 800,000, with a human population of more than 19 million in 2009. According to a recent survey by Beijing magazine Dog Fans, in 2009 there were around 58 million pet dogs in 20 major Chinese cities. The figure has been rising about 30 percent a year. Before the policy was imposed, many dog owners rushed to license, microchip and vaccinated their pets. The government has encouraged the licensing of more dogs by lowering the cost of permits to 500 yuan (US$77) from 2,000 yuan. Many dog owners waited until the lower rates began, causing a rush on animal vaccination centers. There has also been an expansion of animal shelters by the government, as many people are expected to abandon pets rather than pay the license fees. Shanghai citizens who owned two or more dogs before the one-dog policy began to be enforced, are allowed to keep the dogs, provided they have a valid permit for each dog.